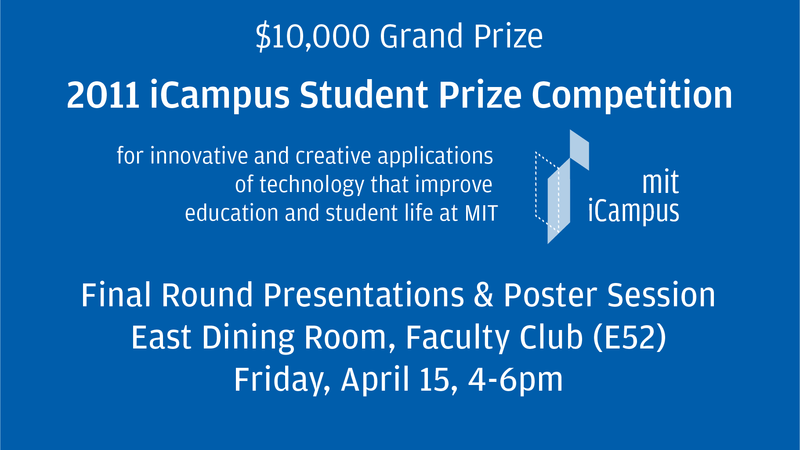 Join us in the East Dining Room of the MIT Faculty Club on Friday, April 15, 2011 from 4-6pm for the final round poster session and presentations. Come out and support your favorite first round winner! Bookspicker: Bookspicker allows students to search for what textbooks are required for their classes, pick the ones they want and look for the best prices online, the Coop or locally. Team: Sinchan Banerjee ’11, Jonathan Goldberg BS ’09 & MEng ’10, and Rodrigo Ipince ’09. 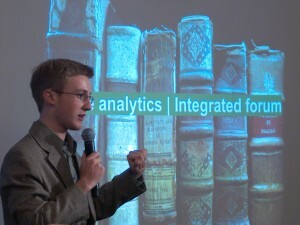 Bookxor: Bookxor closes the feedback loop between students and professors for course notes providing professors analytics and enabling students to study collaboratively. 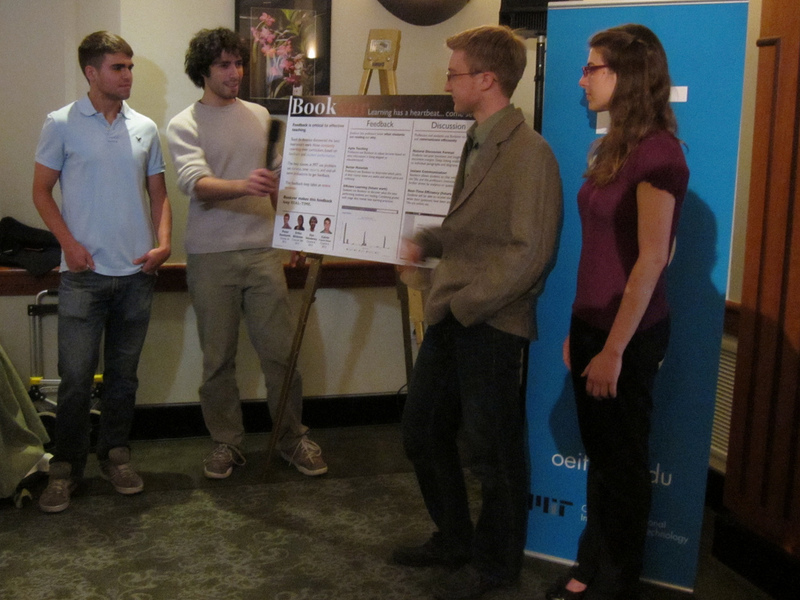 Team: Peter Reinhardt ’12, Erika Bildsten ’12, Ilya Volodarsky ’12, and Calvin French-Owen ’12. CrowdSkimmer: Crowdskimmer helps students “skim” the numerous articles they need to read by providing them keywords and key sentences. Team: Connie Chan ’12. 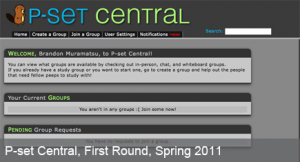 P-set Central: P-set Central helps MIT students find and participate in study groups. Team: Catherine Fan ’14, Victor Hung ’14, Erica Lai ’14, Daniel Meza ’14, and Stephanie Yu ’14. 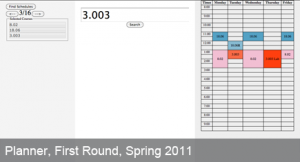 Planner: Planer helps MIT students quickly construct their class schedule. Team: Adin Schmahmann ’13. The MIT Council for Educational Technology (MITCET) and the Office of Educational Innovation and Technology are pleased to announce the five winners of the first round of the 2011 iCampus Student Prize competition. Each of the winning projects embody the spirit of the competition—they are developing real solutions to enhance life and learning at MIT. The 2011 competition is a two-stage competition. In the first round, student teams were asked to create working prototypes, and to define the needs assessment and impact of their projects. In the first round, the winners each received $1,000. First round winners have been invited to compete in the final round where they are competing for an up to $10,000 grand prize and are expected to deliver fully functional projects. The judging panel, which included Paul Oka from Microsoft Research and Hal Abelson the Class of 1922 Professor of Computer Science and Engineering, selected the five first round winners from a pool of twelve applicants. Details on the winning projects, as well as video of the five-minute “pitches” given by the students can be found online at: http://icampusprize.mit.edu/. Please join us as the first round winners present their completed projects on April 15, 2011 from 4-6pm (location TBA). The final round competition begins with a poster session that allows guests and judges to speak with each group and learn more about the projects. The competition concludes with a lightning round of 5 minute presentations by each group. Judges for the competition include representatives from Microsoft Research, MIT faculty, representatives from educational foundations and more. For more information on the iCampus Student Prize, and for details on the final round competition, please visit: http://icampusprize.mit.edu/. Every day at MIT, students and faculty alike use thousands of documents. Professors share course notes with students, students turn in assignments to professors for feedback, and both prepare articles and papers for publication. However, without collaboration between readers and authors, the documents are not improved, despite their heavy use. On the class level, many professors currently have high-quality notes, however they are disconnected from the classroom in that students’ course note-reading experience does not directly impact what is discussed in lecture. A professor rarely knows if his students have read the notes or with which sections they may have struggled. Similarly, the professor does not necessarily know which parts of the lecture were confusing. 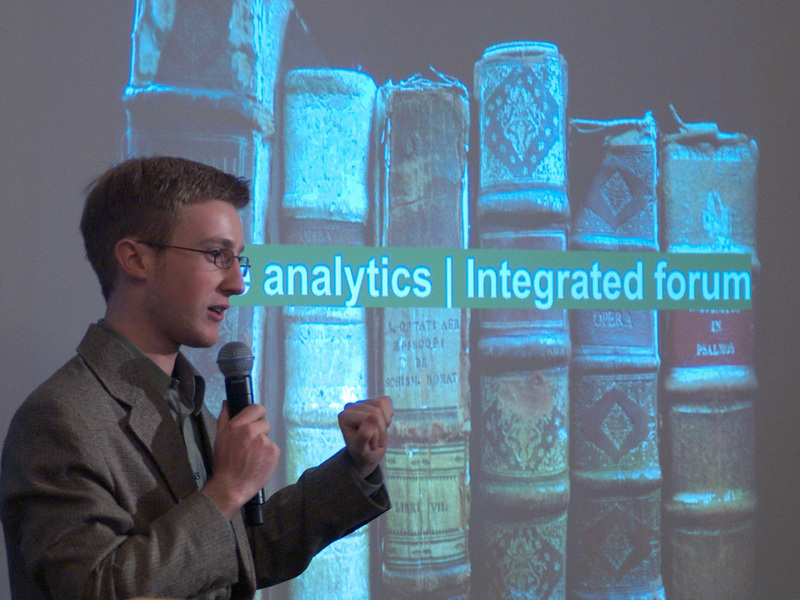 With Bookxor, we set out to provide professors with analytic and feedback tools to better understand how students learn outside of the classroom, while also providing students with tools for collaboration with each other, and further instructor interaction. Source: Bildsten, E. (2011). Bookxor-iCampus Prize Submission Document. Students often face the daunting and time-consuming task of reading articles among articles. Oftentimes, it’s more efficient and effective to skim it first. Skimming texts is an art that takes time to hone. Some people have trouble learning how to skim because they don’t know what and where the keywords and sentences are. 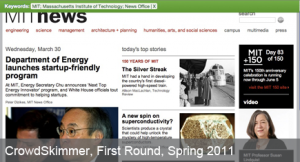 CrowdSkimmer is a Google Chrome Extension that allows users to quickly skim websites and articles by showing them the keywords and key sentences. Source: Chan, C. (2011). CrowdSkimmer-iCampus First Round Submission Document. All MIT students have classes, and thus all MIT students have homework assignments. Some students are capable of completing their assignments on their own. However, the vast majority of MIT students have learned that the most effective way to complete homework assignments is to work together with other MIT students in groups or ask an instructor for help. Working together in groups provides MIT students an opportunity to better comprehend the course material as well as foster teamwork. Unfortunately, there are many external factors that make organizing study groups troublesome. It is very unlikely that multiple MIT students have the same class schedule. Many MIT students participate in sports and clubs. Many MIT students live in singles or live a sizeable distance from other students in their classes (or a combination of the two). Massachusetts weather may deter traveling long distances with its humidity, storms, and snow. As a result of these factors, many students may find difficulty in organizing study groups and many are deterred completely from participating in any. We feel that P-set Central will help MIT students find and participate in study groups. Source: Meza, D. (2011). Project P-set-Central. From observation and personal experience it seems evident that the current tools available to aid students in course selection do not do enough to ease the process. These difficulties arise in scheduling classes for a particular term and also for developing an overall plan of courses to take to complete various major and institute requirements. With Planner, a student is currently able to enter a set of classes that he/she would like to take in a given semester and the set of possible non-conflicting schedules are displayed with the student able to go through the possibilities to find the optimal schedule. This takes out most of the guess work that other tools such as Picker have inherent in them. Aside from the power of being able to quickly construct schedules for the current semester another goal for Planner is to be able to help students plan which classes to take on a multiple semester basis, accounting for classes that are only offered in particular semesters and years as well as major and institute requirements. Source: Schmahmann, A. (2011). Planner. BooksPicker grew out of our own frustrations as students buying books. The COOP’s prices were absurdly high, and the process of buying books elsewhere was time-consuming and tedious, especially when we wanted to compare offers between online merchants and students. But above all we did not like the fact that we could not just enter the classes we were taking to find the books we needed. We designed BooksPicker which allow students to search for what textbooks are required for their classes, pick the ones they want and look for the best prices online, the Coop or locally by selling the books directly to other students. 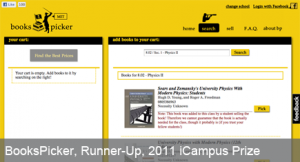 We connected BooksPicker to numerous online stores such as Amazon, AbeBooks and Half-Price Books to get the best textbook offers online to students. For local sales, we developed a local textbook marketplace. Source: Banerjee, S. (2011). iCampus First Round Submission Document. Working prototype submissions are due on Tuesday, February 15 at 5pm EST. Have you ever thought, “My education at MIT would be infinitely better or easier if there was just a technology to…?” Or, “Student life at MIT could be dramatically improved with the creative application of technology?” Well, now’s the time to show MIT and your fellow classmates how you might provide solutions to these problems! 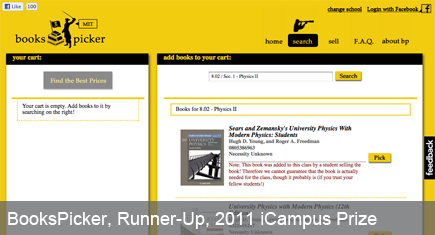 Join the ranks of Course Picker, NB and Lingt as winners of the iCampus Prize! 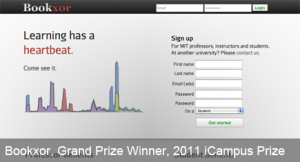 Participate in the 2011 iCampus Technology Innovation Student Prize competition. The 2011 competition is a two stage competition awarding up to $15,000 in total prizes. First-round submissions require a working prototype—up to five $1,000 prizes will be awarded to the top competitors. First-round winners are then expected to compete in the final round – which requires a fully functional submission – for a grand prize of up to $10,000. 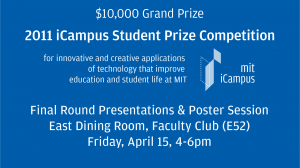 The iCampus Technology Innovation Student Prize recognizes the innovative and creative application of technology that improves the educational and student life experiences at MIT. The competition builds upon the entrepreneurism and spirit of service exhibited by MIT students to solve the world’s problems by focusing attention of what might be improved closer to home in MIT’s education and student life. The competition is open to all currently registered MIT undergraduate and graduate students, both individuals and groups. Entries must involve the use of technology to enhance life and learning at MIT, and they must be developed to the point where MIT could adopt them and make them part of our environment. The Massachusetts Institute of Technology received an endowment gift of $400,000 from Microsoft Research on behalf of the iCampus research collaboration between Microsoft Research and MIT. iCampus projects demonstrated innovative applications of technology for revolutionary change throughout the Institute’s curriculum. Continuing the spirit of this collaboration, Microsoft Research endowed an award to recognize creative student projects in information technology that improve education, community, and learning. MIT gratefully acknowledges this award, and the spirit of creativity that it represents.